I got into a Twitter brawl with Travel & Leisure Wine Editor Bruce Schoenfeld yesterday. The issue was "malo" -- malolactic fermentation -- in California Chardonnays. Schoenfeld's point was that more than 90% of California Chardonnays taste like "malo," which generally tastes buttery in wine. Moreover, the argument is off-base, as Katherine Cole pointed out. I have had bracingly taut Chardonnays from Chablis, Oregon and the coastal Sonoma Coast that went through 100% malolactic fermentation, but the acid was so high you'd never guess if you didn't read the tech sheet. Malo is not the enemy. Moreover, California Chardonnay has adapted: fruit is in, butter is out. At least, that's how it seems to me. So I wonder, how widespread is the belief that California Chardonnay is mostly malo? So I'm going to do two things here. One, I'm going to take a poll. Let's see what most of my readers believe. Does more than 90% of California Chardonnay taste like "malo?" Second, I'm going to ask California Chardonnay makers who do NOT use any malolactic fermentation to say that in the comments. Artisanal Chardonnay producers: are you making wine like Rombauer? If not, let us know. Big producers like Gallo and Kendall-Jackson, please don't be shy. I wanted to cite you as examples: K-J Vintners Reserve Chardonnay is super popular and sure doesn't taste like malo, but I wasn't sure that there isn't 1% malo. So California wine industry, defend yourself. Are you making Chardonnays that aren't buttery? Let the world know. Update: Eric Asimov of the New York Times, included in an earlier version of this post, says by email, "I hardly believe all Chardonnay from California is buttery," and invites readers to read this story of his from April, in which he wrote, "The stereotype of an almost sweet oak-rimmed butter bomb with its cornucopia of tropical fruit flavors has given way (or at least made room) for something much finer, leaner and more energetic." The Hess Collection Napa Valley Chardonnay only puts about 25%, on average, through malo and it's been that way for years. It's not uncommon when I'm on the road showing the wine for someone to say "Wow, this doesn't taste like California Chardonnay"...go figure. Oh, and I love to argue with Bruce as much as you, but I'll defend him here. I have no skin in the game and have no idea what percent of CA chardonnay is malo-free. I'd guess (completely uneducatedly) that it is a small percent, but I don't know what the number is. Kyle: To quote Bill James, "I don't know, and you don't know either." I don't know if the stat even exists. I prefer not to make up numbers in that situation. That's why I'm taking an opinion poll. I cannot easily determine what the real percentage of non-malo Chardonnay is -- but I CAN determine what my readers believe about it. Malo doesn't mean rampant diacetyl. Yes "d" is a by product of many lactic bacteria. However, it is also metabolized by yeast. Extreme butter is either a choice or a mistake. You can manage diacetyl and many producer who do malo, manage it quite well. Even 100% ML doesn't always taste like the stereotype of ML. It depends on the grapes, strain of yeast used for the ML and other factors. The answer to the 90% question depends on whether or not we mean 90% of the labels or 90% of the volume. I suspect that, by volume, the vast majority of California Chardonnay still tastes at least somewhat sweet and buttery. And, for that matter, there's probably a lot of non-Chardonnay in it. But, if we're talking about labels, then I agree with you [Blake] that the percentage of productions with overtly buttery flavors must be well under 90 at this point. Fred: Defining terms is key, agreed. I disagree with you about volume, though. "Sweet," yes. 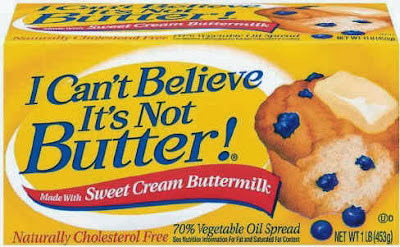 "Buttery," not anymore. I tasted a lot of cheap Chardonnays, some very high-volume, at California State Fair this year. Buttery flavors were rare. I would argue that that shows what the big wine companies think Americans want -- and the big companies are supposed to be good at knowing that. I think that there is a common misperception about the connection between "buttery" flavors and ML in Chardonnay. I have many times presented Chardonnays to other winemakers for feedback that had zero ML yet were loaded with this flovor, and conversely have presented full ML Chardonnays that had no hint of "butter". In my experience the flavor profile of ML perse in Chardonnay is more akin to fresh yogurt than to butter. In any case these aromas specific to ML are quite ephemeral. What most people catagorize as "buttery" are more often than not caused by a combination of oak extractives and yeast formed flavors. For some time ML bacteria selections that produce no diacetyl whatsoever have been available and have been utilized by many winemakers who wish for a nuetral flavor effect from the ML. It is also worth noting that the lactic acid produced has different flavors than the malic it is formed from during ML, and the lactic acid esters that result in general make positive contributions to flavor in Chardonnay. The ML bacteria also aid in the realease of flavor from the yeast lees creating significant flavor increases and improvements in mid- palate silkiness. Come on, Blake. You're better than this. I never mentioned sweet or buttery. I never said I liked or didn't like most California Chardonnays. I never even said that I believed most did or didn't taste like malo. Read the thread, OK? My comment was that I wish more mainstream producers made 100% non-malo Chards. That's it. I totally agree that more are doing it than 10, 5 or even 3 years ago. But mainstream producers making TOTALLY non-malo Chards? I talk to plenty of winemakers, and the answer is ... not many. I don't get where the rest of this came from, beyond you willfully misinterpreting, setting up a straw man to argue against. But if you disagree with the above statement and think it comes from 2006, as you snidely posted, I think you're a lonely man. At Nottingham Cellars, we produce 2 Chardonnays, one ML positive from Livermore Valley fruit, barrel fermented sur lie aged, the other done in stainless, no ML from Arroyo Seco. Personally, I prefer the stainless. I believe the "malo" flavors your twitter battle buddy speaks of actually come from lees stirring. In a portion of ,y ML chard, I do not stir the lees. This gives me some blending options at bottling. Conversely, I stir the lees in the tank of my ML negative chard. This helps tame the acid without going ML. Some people say its tastes buttery, or "like malo". I just want to add that "tastes like malo" means nothing. Tastes buttery, creamy, rich, mouth filling, I get those things. Tastes like malo means nothing to me. Grgich Hills Estate Chardonnay has always been without ML. It's the style that Mike Grgich developed at Chateau Montelena. Interestingly, we get consumers coming up to us at tastings and say, "You and Rombauer are our favorite Chardonnays" when they are very different styles. Great Post Blake... The malo thing used to be whole lot worse. Everything cycles back and around, yeah the wine business is like a going to carnival. I laughed so hard at the graphic I almost sprayed coffee on the monitor. Thank you for the levity. I think this issue shows the "wine by numbers" fallacy. I am probably as surprised as not by how a wine actually tastes as opposed to how it ought to taste, given technical specs. I have tasted high alcohol wines where I could not detect the alcohol, etc. There just seem to be too many exceptions for the rule to stand. One component of the wine will offset another and so you often do not get what you think you will get by looking at the specs. If I were to have to come up with an exception, it would probably be acidity, but other than that, the back label specs provide more interesting anecdotes than actual descriptions of what you taste. My first reaction was that it's silly to even pigeon-hole "California" Chardonnay. As you mentioned, there are colder climate regions such as of the west side of Sonoma Coast, Arroyo Grande Valley, Sta. Rita Hills, Santa Maria Valley where Chardonnays are produced with 100% or at least partial ML as a matter of course because of the naturally high acidity of those grape. It makes sense to do little or no ML in warmer regions yielding lower acid grapes, such as Napa Valley, Inland Mendocino, Paso Robles, etc. I would presume that part of the objection to "malo" taste is stylistic. We can all see that a growing percentage of consumers are leaning more towards Chardonnays that taste outwardly tart and minerally rather than soft, fruity, or "buttery." Obviously, it's easier to produce the former in colder climate regions, and the latter in warmer regions. But it's also a matter of chosen style, or branding. David Ramey, for instance, is largely acknowledged as a great producer of Chardonnay -- he sources from cooler climates and smaller cluster clones (primarily Old Wente selections), and always opts for full ML to achieve the textural complexity possible through ML. I suppose, in that sense, Ramey Chardonnays could be called "buttery," but they certainly don't smell buttery; nor are they "fat" with fruitiness -- more accurate descriptions are crisp yet fleshy, intense yet elegant, and multifaceted rather than simple. In other words, Ramey produces "great" Chardonnays. ML has a lot to do with it, and so does vineyard sourcing, judicious oak, and a host of largely minimalist winemaking decisions -- the same as we see in the best Cote de Beaunes. Ergo: ML is not a "bad" thing in itself, and neither is the decision to garner the textural complexities possible from ML. If anything, non-ML Chardonnays made from riper, lower acid grapes are at a disadvantage because they lack that component. But of course, if you're a consumer who prefers tart Chardonnays with less textural complexity, then by all means you should go for the non- or low-ML Chardonnays. Ultimately, it's not a matter of what is good and what is bad, and it's downright ignorant to talk about California Chardonnays as if they were all one and the same. It's even dumber to say that "all California Chardonnays should be made with no ML," or vice-versa. For consumers, who drive the whole thing, it's a matter of choice -- like the choice of oak or no oak, or a sharper Chablis as opposed or a fuller, more viscous Meursault or Puligny-Montrachet. If they all tasted the same, it wouldn't be nearly as interesting, wouldn't it? There are people who swim against the tide of excess in California and, in particular, Napa. Hanzell has always been one. Scribe is a newcomer. They, however, are and remain outliers. The truth is most California Chardonnay is grotesque, and the more expensive (and "cult") it is generally the more of a grotesque funhouse mirror version of Burgundy it becomes. Kongsgaard Chardonnay is the perfect example of this, despite Mr. Kongsgaard's proclivity to say "Burgundian" in every other sentence that comes out of his mouth. Last month I opened a $100+ bottle of Vineyard 7&8 Chardonnay given to me by an industry colleague to drink with a veal chop with a dijon, shallot and mustard pan sauce. I took two swigs of this abortion in a bottle that tasted and smelled of nothing more than buttered popcorn before dumping it down the drain and opening the bottle of Alsatian Riesling that I should have reached for in the first place. We at Revolution-wines in Sacramento do about a 25% malolactic portion of barrel fermented chardonnay, 25% barrel fermented non-M.L.F. The remainder is fermented at a colder temperature and is aged in barrel post alcoholic fermentation. No butter, better mouthfeel.